A moonlit night, a starry sky and the company of someone special: It’s the perfect setup for romance, and the inspiration for a celestial celebration dreamed up by Southeast Portland–based photographer Rebecca Rizzo. 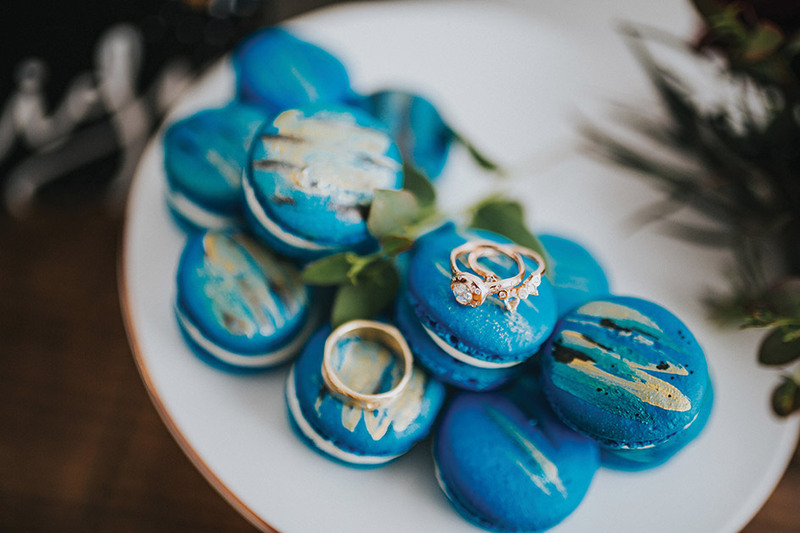 Playing on the time-honored trope of the stars and fate intervening to bring lovers together, Rizzo and a team of Portland-area vendors realized the stellar theme in shades of blue and gold. “They’re the colors of the sky just after the sun sets, or the blue hour, when you can just start to see the stars,” says Rizzo. We asked her to break down the elements that comprise this heavenly tableau, all beautifully planned and styled by Peachy Keen Coordination. sparkling golden stars seemed perfect,” says Cynthia Kessler of Gemini Design House in Troutdale. Custom invitation suites start at $1,500 per set of 100. 2. 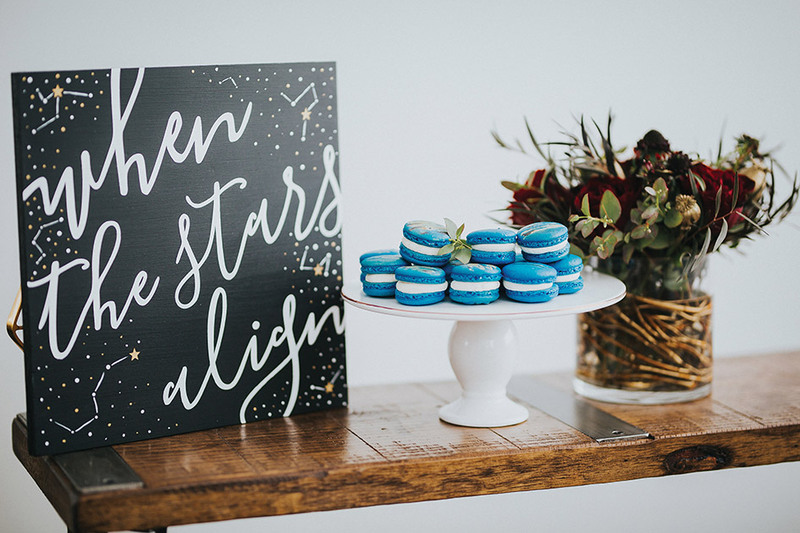 Star Sign: A custom wedding sign announces the celebration’s theme and serves as an enduring keepsake after the guests have gone home. This hand-painted sign by Freckled & Free in Portland features a scattering of gold and white constellations on a black background. Custom 12-inch signs start at $30. 3. 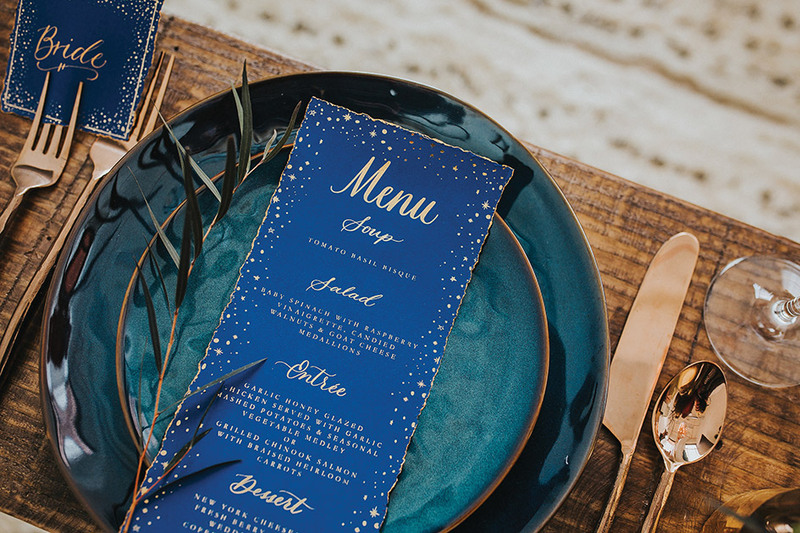 Deep Blue: Dramatic azure dinner and salad plates from Vintage Meets Modern Event Rentals in Milwaukie reflect the beauty and depth of the night sky. Rustic, irregular shapes and a modern, high-shine glaze combine with copper flatware to produce a striking effect. Price upon request. 4. 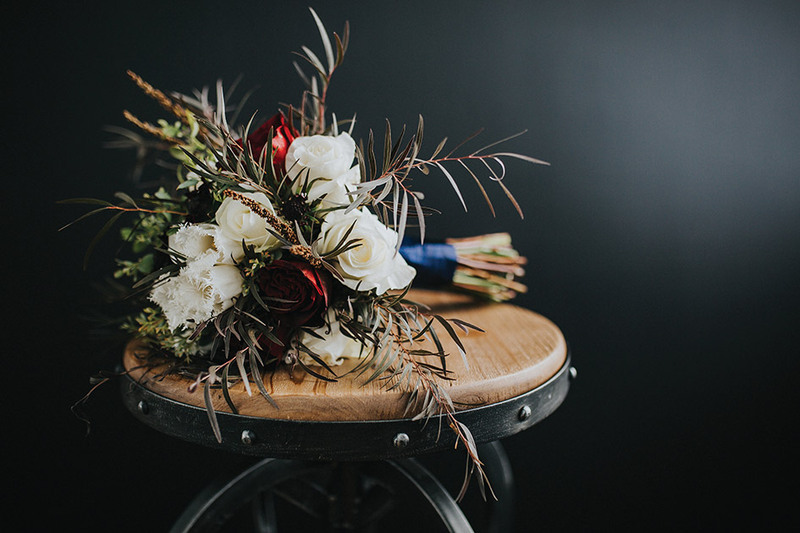 Astral Arrangement: Alana Weintraub of Flowers by Alana in Milwaukie interpreted the starstruck theme in a bouquet of roses and tulips accented with gold-painted poppy pods, millet and curly willow. “I wanted to bring the contrast of dark and light, just like starlight contrasts against a jet-black sky. The pops of gold, the star-shaped poppy pods, the jagged edges of the tulips and roses, and even the eucalyptus greenery bring in celestial elements in texture, shape and color,” says Weintraub. $150. 5. 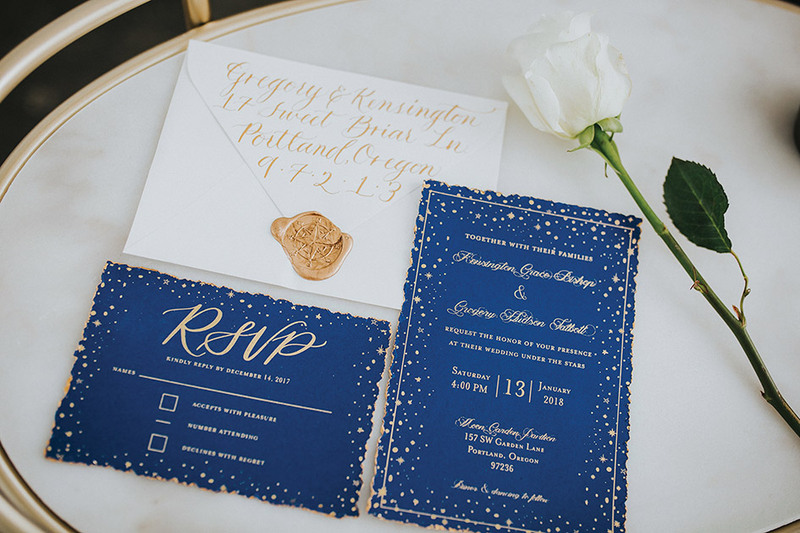 The Write Stuff: A golden swirl of hand-lettered script and a compass wax seal complement the invitation suite’s starry theme and strike a romantic and whimsical note. 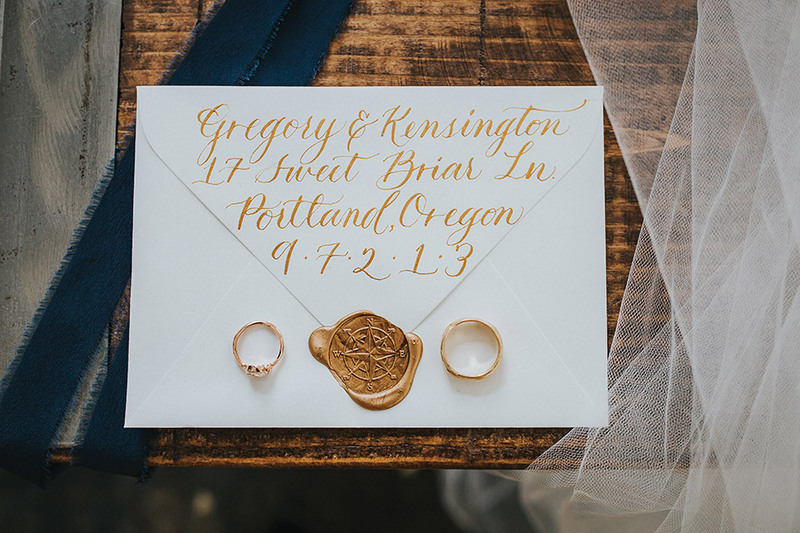 Calligraphy and wax seal by Gemini Design House. Calligraphy starts at $3/envelope. Wax seals start at $1.50/envelope. Rings by Pippa Jayne Designs (price upon request). 6. Sweet Sendoff: These elegant, hand-painted macarons from Mama’s Artisan Sweets in Beaverton make sophisticated favors for your guests. $24 per dozen. Rings by Pippa Jayne Designs (price upon request).